Reducing waste, buying organic, reducing your carbon footprint. These are all terms we are becoming used to and conscious of in our daily lives – but what about when you travel? These things are just as important (if not more) while exploring the world as they are at home. Plus, the good news: it’s much easier than you might think! As our worldwide passion for travel increases, so does the impact of tourism on the environment, especially in developing countries with poor waste disposal and recycling systems. Eco-friendly travel isn’t just for hippy tree-huggers: it’s the responsibility of everyone who loves to jump on planes and see the world. Use these green travel tips to help you to reduce your impact on the Earth while you head off to explore all the beautiful places it has to offer. Eco-friendly travel is all about considering the environment in your travel choices and finding ways to be more sustainable, while still sticking to a budget, getting off the beaten path or backpacking long term. These are just a few ways you can do your bit to keep the Earth clean and green. One million plastic bottles are used EVERY MINUTE and most of these ends up in landfill, forests and oceans rather than being recycled. It’s now more important than ever to ditch those plastic bottles and get yourself a refillable drink bottle to take on your travels. But what about in countries where you can’t drink the tap water? Don’t worry, there’s a solution for that too. Get yourself a filter or steriliser such as a Steripen or Lifestraw so that you can fill up anywhere. There are also a surprising number of cafes, hostels and tourist attractions that offer free or cheap bottle refills. Keep an eye out and save the world from a few more of those dastardly bottles. Just about any transport method is eco-friendlier than flying and almost always cheaper. Same goes for public transport: the more people sharing, the more eco-friendly and cost-effective. Swap the generic departure lounge of Airport X for gazing at landscapes on a train through Switzerland, mingling with locals on a Peruvian bus or bumping your way along winding roads in a shared jeep in Nepal. Better still, use your legs or hire a bike to explore a city for the day. Half the fun of being in a new country is the opportunity to try new foods and buy things that you can’t get at home. The further the ingredients or parts must travel, the more impact it has on the environment. Try to eat at places with locally sourced ingredients and buy your souvenirs directly from the artisan. Anyway, food tastes better when it’s fresh rather than after a few days in a truck, and gifts and keepsakes make better stories if you’ve met the people that made them. So, it really is a win-win situation. Straws are another plastic item that mostly ends up in landfill. But let’s face it, how many drinks require a straw to consume them? Simply order your drink and ask for ‘no straw please’. This message often gets lost in translation especially in countries with little environmental awareness, but it can’t hurt to try. If you do like to use a straw (or plan to drink coconuts on the beach – yes, please!) then consider getting yourself a bamboo or metal straw to take with you. When travellers stay in hostels or hotels, they often tend to get reckless with power and water just because they don’t pay the bills. But remember, the environment still suffers. Make sure you exercise the same care you would at home, or even more if you are in an area with water shortages or limited power. Switch things off when you aren’t using them. Take shorter showers and only use A/C or heating when necessary. Lots of hostels and guesthouses have started to use the buzzword ‘eco’ to describe their practices. But there are some who actually live up to their word and make an effort to use eco-friendly products, run on solar power, serve organic food, minimise waste and even have composting toilets! 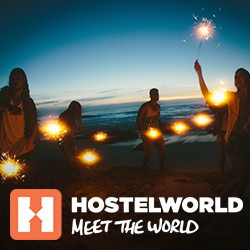 Stay tuned this month for Hostelworld’s new blog featuring the best eco-friendly hostels around the world. Finding organically made shower products that are friendly to both animals and the environment is much easier than you might think. Most supermarkets stock a range of these, plus there are specialist shops popping up everywhere with products that work wonders and smell utterly delicious. Supporting these companies and taking their products with you on the road is one step to greener travel – but it’s even more important if you’re travelling to places without developed wastewater systems. Often what you wash with ends up in nearby rivers, so be mindful of the animals and locals who use the water by using products that don’t have harmful ingredients. Bringing your own products also means you can say no to those tiny hotel shampoos. Let’s face it: the shampoo is never that great and it creates more plastic waste for the world. If you’re travelling for a longer period, consider using solid shower products such as shampoo, conditioner and soap. They last a lot longer, take up less space and don’t come in a plastic bottle. There are some brilliant ones available that do the same job as a liquid, such as the Sea Salt and Lemon Shampoo Bar from LUSH – which I love. Over-tourism is ruining a lot of the world’s most beautiful attractions but just because they’re popular doesn’t mean they have to suffer. Being respectful when visiting attractions, particularly natural ones, is simple and necessary in any country. Don’t litter, stick to the paths and look out for ethical tour companies if you need a guide. Always do your research if the attraction involves animals and investigate how they’re treated. Many organisations are doing great things to rehabilitate and care for animals but there are also some that exploit wildlife to get those tourist dollars. These green travel tips are just the start of the many ways to care for the world while travelling. If you want to do more, you could try volunteering on eco-projects or even giving zero-waste travel a go. But taking these important steps towards eco-friendly travel means that beautiful waterfall or those lush green forests will still be here for future generations to enjoy without the piles of trash. The post Green travel tips: how to stay eco-friendly on the road appeared first on Hostelworld Blog.